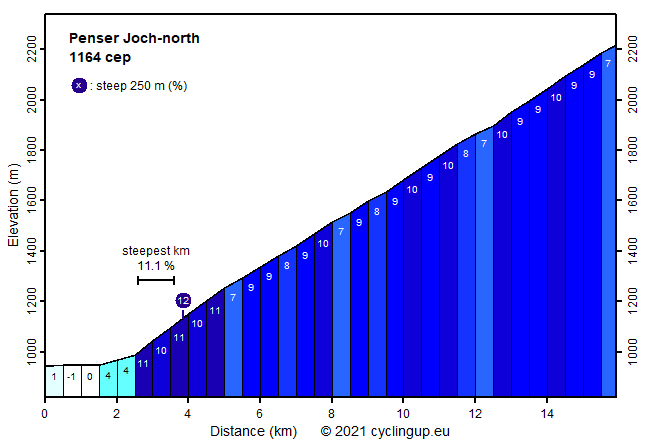 The climb to the Penser Joch (Passo di Pennes in Italian) from Sterzing (Vipiteno) is pretty heavy. A considerable number of elevation meters (1275) must be overcome and the road is really steep. However, at the beginning this does not seem to be the case. The first two and a half kilometers until Elzenbaum are a piece of cake (a maximum inclination of 4%). On the remaining 13.4 kilometers, though, 1226 elevation meters must be gained. This corresponds to a slope of as much as 9.1%. On the other hand, the slopes of all of the individual 500 meter intervals (7-11%) deviate only little from this average. By the way, the steepest kilometer (11.1%) of the ride is found immediately after Elzenbaum. The ride offers many views, first over the Eisacktal and in northern directions of Sterzing and of the main chain of the Alps. Later, when the road leads into the Eggertal, the panorama is dominated by the Tatsch (Montaccio, 2526 m), located on the other side of the valley.